Jeffrey Gibson, In Numbers Too Big to Ignore, 2016, glass, artificial sinew, copper, metal, wool, wood, 61 x 43". For two days during the winter of 1993, Guillermo Gómez-Peña and Coco Fusco performed as ostensible natives from the mythical island of Guatinaui in the main lobby of Chicago’s Field Museum. In a sturdy cage, the pair of artists enacted supposedly traditional dances, crafted voodoo dolls, watched TV, and paced the interior perimeter of their confine. Fusco wore a grass skirt and face paint, while Gómez-Peña donned a wrestling mask and blue shorts. The performance was an act of absurdist cultural appropriation, which in turn exposed the unethical and routine practices of Western colonization and museology. The outrageousness of this work was stunning then, and more recently I found myself craving its critical brazenness when viewing Jeffrey Gibson’s exhibition of hard-edge paintings and beaded works that also challenge assumptions of cultural ownership. Gibson, who is half Cherokee, draws a formal line from the visual languages of native heritages to that of twentieth-century modern abstraction. These expertly converge in an acrylic painting made up of gradient bands of orange, red, green, and blue. Titled Thinking of You, 2015, the diptych supports a substrate of stretched rawhide that is visible along the edges of the triangular composition. This painting, along with the artist’s other acrylic abstractions, stands in contrast to his bedazzled objects. 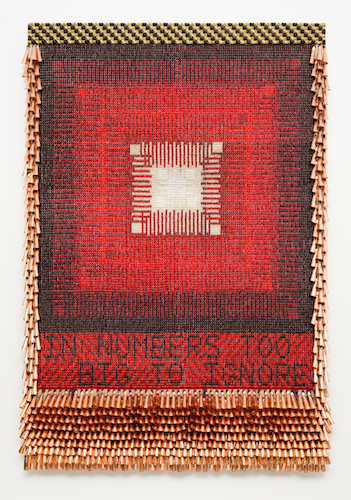 For example, a red radiant square motif densely patterned with glass beads, copper jingles, and metal studs is branded with beaded text that reads “In numbers too big to ignore,” abandoning abstract painting’s formal and analytic discourse for a radically indeterminate investigation into the contemporary complications of originality, invention, and authority. Moreover, all of Gibson’s beaded work addresses the ethically fraught issues and critical potential of cultural appropriation, a subject as pressing today as it was when Fusco and Gómez-Peña performed as “natives” in a natural history museum.